Cancer is defined as abnormal growth of cells in an uncontrolled manner. The cancerous cells can spread to other body parts, giving rise to a debilitating condition. कैंसर किस कारण से होता है ? Cancer sets in, when the normal healthy cells of the body are replaced by malignant tumors which keep on replicating. These cells do not die and take undue charge over the normal phenomenon of programmed cell death. Many Chemicals, Genetic Factors, Physical factors, Environmental Factors, Radiations and drugs can trigger this cancerous growth of cells. Tobacco is a common example. What are different types of Cancer? कैंसर के विभिन्न प्रकार कौन से हैं ? There are over 100 forms of cancer, which are characterized based on the type of the cells that are affected. Some examples of types of cancer include leukemia, adrenal cancer, brain cancer, lung cancer, skin cancer, breast cancer, bone cancer, cervical cancer, colon cancer, endometrial cancer, gastric cancer, ovarian cancer, uterine cancer, kidney cancer, esophageal cancer, etc. Does cancer spread from person to person? क्या कैंसर एक व्यक्ति से दूसरे व्यक्ति को फ़ैल सकता है? No, cancer is not considered to be an infectious disease and it does not spread from person to person. कैंसर के लक्षण क्या हैं ? Symptoms of cancer are varied and depend on the type of cancer that has set in. The most common symptoms include tiredness, fever, undue weight loss, and anemia. When the cancer spreads to other body parts, patients may experience additional symptoms such as hoarseness in voice, persistent cough, headaches and sweating. कैंसर की पहचान कैसे की जाती है ? Sometimes it really gets difficult to diagnose cancer in its initial stages. The symptoms being so common, and since it can often be a part of other common maladies are conveniently ignored by the sufferer. However, regular checkups and keeping track of the nature of symptoms can help in diagnosis of cancer in its early stages. 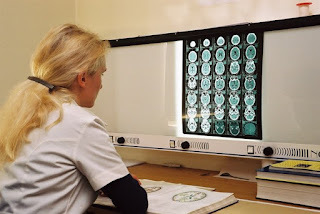 Various types of imaging studies such as x-ray, CT scan, MRI, ultrasound as well as PET scans of the affected area is done to determine the size and type of tumor. In addition, an endoscopy and bronchoscopy may also be required to investigate other abnormalities. And once the tumor cells are identified, biopsy is done to investigate the nature of the cells. What are different stages of Cancer? कैंसर की विभिन्न अवस्थाएं कौन कौन सी हैं ? Cancer progresses in 4 basic stages. Stage 1 comprises of the state when the cancer has just begun and has still not spread to other organs, other than the one which is affected. In the next stage, the tumor cells begin to grow deriving nutrition from the healthy cells. The cancer however has not spread to the other parts. In stage 3, the tumor cells grow larger and it has started spreading to other organs as well. Stage 4, marks the last stage of cancer, wherein the cancer cells have affected all the organs. कैंसर का इलाज़ की है ? Treatment of cancer largely depends on the type of cancer that has set in and the stage at which it has been diagnosed. Early stages of cancer can often be successfully treated with combination of surgical and radiation therapies. However, as the cancer begins to spread to other body parts, surgical removal of the cancer cells becomes a daunting task. In such cases, radiation and chemotherapy methods are used for destroying the cancer cells. In addition, other methods include immunotherpay, hormone therapy and gene therapy. What are common myths about treatment of cancer? कैंसर के इलाज़ के बारे में आम गलतफहमियां क्या हैं ? Truth: Many types of cancers, if timely diagnosed, can be treated. Yes some cancers still cant be treated. But many new treatments are in pipeline which will change the course of action in coming years. कैंसर से बचाव कैसे किया जा सकता है ? The following steps can be adopted to prevent cancer. What to do if I suspect I have cancer? मुझे शक है के मुझे कैंसर है। क्या करूँ ? If you suspect that you have cancer, it is best to consult a doctor and get yourself tested. Timely diagnosis can help in early initiation of treatment and prevent the spread of cancer to other body parts. What to do if I am having cancer? मुझे कैंसर है। क्या करूँ ? If you have been diagnosed with cancer, it is advisable to strictly follow the treatment plan as given to you by your doctor. Adhering to healthy diet and lifestyle along with the prescribed treatment regime will help you fight cancer. What is Ayurvedic treatment of cancer? कैंसर का आयुर्वेदिक इलाज़ क्या है ? Ayurvedic herbs such as Ashwagandha, garlic, celandine, green tea, aloe vera, ginger root and turmeric are proven to be helpful in the treatment of cancer. These herbs can be used in conjugation with other treatment methods for speedy recovery. What is homeopathic treatment of cancer? कैंसर का होमियोपैथी इलाज़ क्या है ? Homeopathy alone cannot cure cancer. However, when it is used in conjugation with allopathic treatment methods, it can significantly speed up the recovery process. Some of common homeopathic medications used for treating cancer include: conium, phosphorus, arsenicum album, hydrastis, carcinocin, barytamur, silicea, lapis albus, and plumbumiod. What are the dietary recommendations for cancer? कैंसर में खान पान का क्या ख्याल रखना चाहिए ? A healthy diet that is rich in plant proteins is recommended for cancer patients. A low fiber diet is also suggested as individuals with cancer often fall prey to debilitating symptoms such as diarrhea and abdominal cramping.